There are numerous health benefits of honey. Such are controlling levels of cholesterol, strengthening the immune system, improving your skin and many more. Also, if you have been a victim of coughing endlessly at night, early morning, or during cold seasons, then, pure honey is all you need before you can even think of seeking any medical attention. Honey, since ancient days, has been known for its healing properties. You can consume it as it is, apply it on snacks such as bread, mix it with clean drinking water or natural herbs. So, where does honey come from? Bees make this natural sweetener using nectar obtained from flowers. You can choose to consume it natural or after being processed. However, natural (raw) honey is the best since it contains the wax, pollen, and yeast which aid in boosting your energy, giving you sound sleep and protecting you from seasonal allergies among others. Let’s get down to discussing the health benefits of honey. Are there health benefits of honey to your scalp? Yes, there are. Honey is said to have the antibacterial property which aids in eliminating dandruff. But how do you go about applying it on your scalp? Firstly, apply some water on your hair to make it wet. Secondly, add raw honey to clean water. Remember, the amount of honey should be 90% while water should be 10%. Gently massage for at least 3 minutes and leave for about 3 hours. Meanwhile, you can read some blog posts, listen to music as the antibacterial and antifungal properties contained in honey sooth or heal any areas that are infected or wounded on the scalp of your head. Finally, use some warm water to rinse. You have just dealt with the issue of dandruff and can now rest, and do your daily work peacefully. However, you need to be doing this once in a while. Once a week is okay or as you find it right for you. Honey, mostly buckwheat, when taken can be an excellent way to keep coughs, cold and sore throat at bay. The thick consistency in honey coats your sore throat thus soothing it leaving you feeling better. Also, for people with asthma, it can come in handy to control coughing. 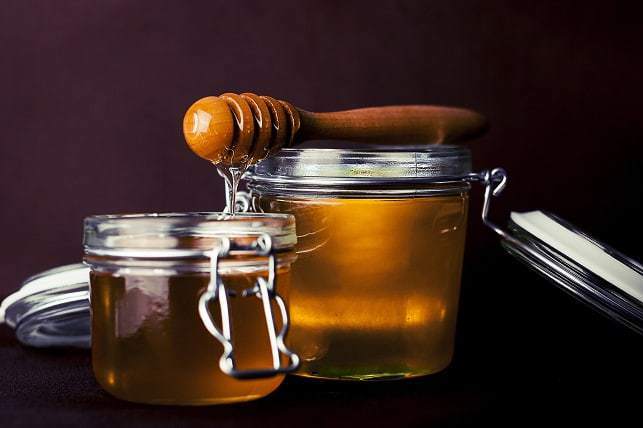 Intake of honey increases the production of saliva which lubricates the airways which in turn lowers throat irritation thereby eradicating the cough. Honey also contains an anti-inflammatory property which lowers the swelling of the airways which are as a result of asthma. The fact is, the health benefits of honey obtained from your local area are considered more since it helps lower the allergic reactions caused by the pollen of the flowers in your locality. Two tablespoons during bedtime can go a long way in lowering cough during the night thus giving you a restful night. Honey is not only good for lowering and preventing coughs and cold in adults, but also in children. Nevertheless, it is not advisable to give honey to children under the age of one year. Research has proved that honey has great potential to boost your memory while metabolic stress lowers as well. The antioxidants contained in honey are said to boost your memory by reducing cell damage thereby protecting your brain. Research conducted by the University of Babylon (College of Medicine), between the year 2003 to 2008, proves that honey taken daily by people of age 65 and above, had the potential to lower the risk of developing dementia. This natural antioxidant and the therapeutic properties decreases the risk of dementia. More so, there are exciting health benefits of honey for women who take at least two teaspoonfuls of honey daily since it preserves their memory during postmenopausal years. You have the power to improve your memory, boost your concentration just by taking raw honey each new day. Do you worry about premature wrinkles? Don’t stress any longer; there are numerous health benefits of honey in the antioxidants properties which enhance protection of your cells from any free radical harm. You don’t have to spend a lot of money buying bleaching agents for your body just because you want to get rid of premature wrinkles and spots on your face. After all, it is very unhealthy to use such chemicals. With the honey in your house, you’ve got all you need to get rid of spots, get a shiny and even skin. More so, honey helps treat other problems on your skin such as acne. Continuous application of honey prevents reoccurrence of acne. So, don’t apply it once and call it over, make it your duty to use honey on your body regularly. You may also use it to do body scrubbing. Again, if your lips crack during winter, honey will take care of such issues. Honey also heals wounds and burns due to the natural antibacterial, antifungal, and antioxidants properties it contains. In case of a burn or a wound, apply honey directly to the affected area. You can also choose to use it on the dressing but be sure to change it after 24 to 48 hours depending on the condition of the wound or burn. Honey also prevents the dressing from sticking to the wound. It also destroys any bacteria that try to infect or penetrate through your skin after an injury that results in a wound. After the wound has healed, usually, there is a scar, honey reduces that scarring too. It is crucial to note that people who have diabetes are at high exposure to foot ulcers. Thanks to honey, it treats these ulcers thereby lowering the danger of amputation to the patient. This sweetener not only heals wounds but also decreases the painful swellings and gets rid of dead skin tissues. However, it is crucial to remember that the first thing to do after a burn is to pour cold water onto the affected area for about 15 to 30 minutes. You can then apply honey after the body temperature has gone down to the normal rate. Nevertheless, it is vital to seek medical attention first in case of any severe burns. Do you want to boost the performance of your body? Does your body feel weak? Taking honey will stimulate your body performance and strengthen it by providing it with the strength it needs instantly. Honey is also good for athletes since it lowers muscle fatigue thereby improving their performance. Honey has glucose in it which is quickly and easily absorbed into the body thereby boosting body energy. Applying it on a piece of toast or adding it to a cup of tea or coffee in place of sugar will energize your body for the rest of the day. If you love going for a workout, consider taking some honey before you go for a workout. You will feel energized all through the working out session. Honey is an excellent way to take care of your health either by taking it or applying it to your body. Don’t allow a cough, cold, wound, burn and the like; run out of hand and ruin your day. Deal with each of them as soon as possible using honey. There are many more health benefits of honey, and most people who sell honey know that too well. You’ve, therefore, got to be on the lookout to ensure you get pure honey, and more so unprocessed honey to enjoy the full benefits of honey. Mary Peter is a versatile full-time writer. She has a passion for health and Christian writing. She has been writing for close to two years on Upwork. When she is not writing, Mary will either be out doing exercise to keep her health in check, or on Christian missions.